“Hey Julio look at the water!” There are no clouds, “it’s not raining”. I quote this from another one of our members Tony Plutynski. 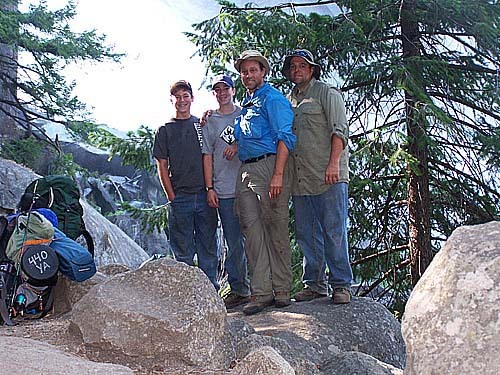 This was a first trip to Yosemite for my brother and 2 nephews. 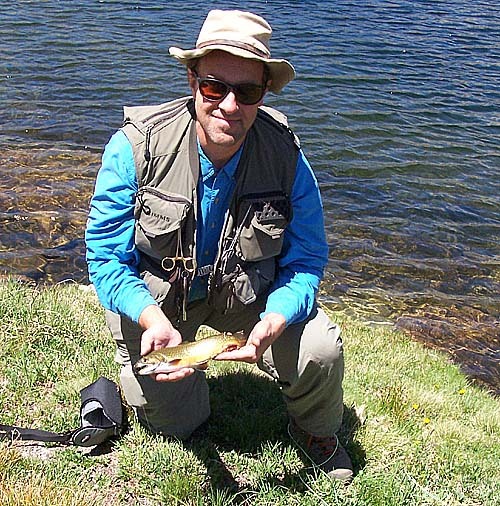 Of course why go to all the trouble of backpacking if you’re not going to fly fish. Since they were new to the sport I do as I usually do and how I learned from Tony. No fancy fly casting for them, I’ll save that for me! I set them up with the bubble and fly method which I will definitely bring along next time as well as my fly rod. The lakes that I will tell about are accessible to anyone with a strong pair of legs and good lungs. They are not off the beaten path or hidden by trees. They are on the trail and marked quit clearly. 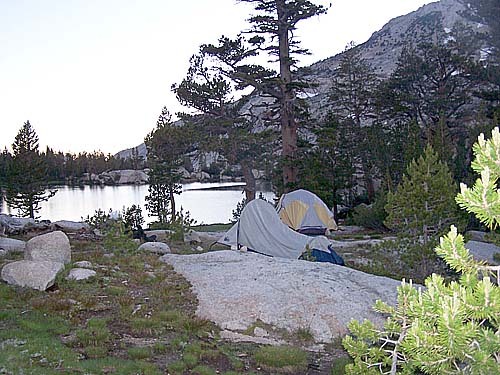 But not everyone goes to Yosemite to fish, in fact most don’t so these lakes are not overly fished and this year all High Sierra Camps where closed so we saw no one at lakes 1 and 2. Lake three and the river below had a few travelers but we did not see one fisherman until we ventured into the valley. In the valley or close to it I saw 1 or 2 fisherman and that was it. They were not fishing they were trying to hike past the falls with little more than day packs. At Lake 1 there were tons of mosquitoes but this is not average. We had quite a bit of snow and rain fall this year. The high country is still wet and these creatures are breeding up a storm. In the evening lake one looked as if it were raining there were so many rises. The fish were on the small size but almost any time of the day you could catch your limit in a few minutes. Every cast had about an eight inch brook trout for you. At Lake 2 I had heard stories of the large size brook trout there. We were at this lake for only a couple of hours due to our travel plans. We had our limit in about 15 minutes and they were all 14 inch brookies. We did not try that hard to be stealthy and only fished a small area of the lake, about 100 yards worth. 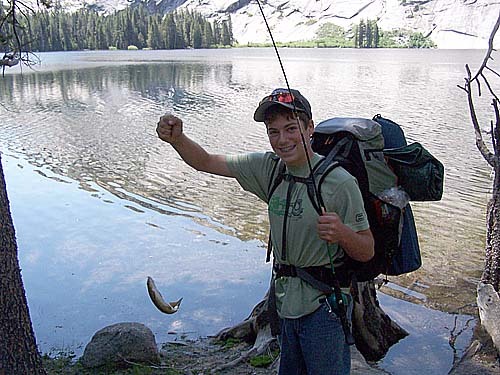 If we would have fished the whole lake or stayed longer we may have found even larger ones. Lake three was a challenge for me to cast at. The water level was up about 10 feet from the last time I was there so I decided to guide my brother and nephews there. Again they soon had there limits using the bubble and fly method. At this lake there are mainly brown trout and with out too much trouble they caught them in the 12-14 inch range. From the outlet of lake 3 most of my previous spots on the river were blown out. We did manage to find a pool we could fish and shortly I had a nice brown and then a rainbow. All beautifully marked and guaranteed wild trout. As we got closer to the valley we wished were still up in the high country, were the air and water is clean and the people are few. I must say that I showed my family the true Mist trail and all the falls were flowing at their larger potential.